An American-backed Syrian Kurdish militia has joined forces with some Arab rebels and members of an Assyrian Christian group to launch an assault against the Islamic State (ISIS/ISIL) in Raqqa, the jihadist group’s de-facto capital in Syria, according to a statement obtained by Reuters. The coalition is reportedly aimed at establishing democratic representation for various moderate parties in Syria. Dubbed the “Democratic Forces of Syria,” the new alliance includes the Kurdish People’s Protection Units (YPG) that, assisted by U.S. airstrikes, pushed ISIS out of the town of Kobani earlier this year, located along the Syria-Turkey border. The alliance also includes various Arab groups including Jaysh al-Thuwwar (Army of Rebels) and the Arab tribal Jaysh al-Sanadeed, as well as an Assyrian Christian group named the Syriac Military Council (MFS) that is currently fighting ISIS in northern Syria, according to the statement obtained by Reuters that announced the coalition’s establishment. “The sensitive stage our country Syria is going through and rapid developments on the military and political front… require that there be a united national military force for all Syrians, joining Kurds, Arabs, [Assyrians] and other groups,” said the statement, which was sent to Reuters by a YPG spokesman. “Given that these forces in general are democratic and secular forces that believe to a great degree in diversity, we hope that they will receive support” from the U.S.-led coalition, Nasir Haj Mansour, an official with the Kurdish defense ministry in YPG-held territory, told Reuters. “The current goal in practical terms is to confront Daesh, given that it is the first enemy, but the goal is also to build a democratic Syria in the future,” he added, using the acronym for ISIS’s original name in Arabic. 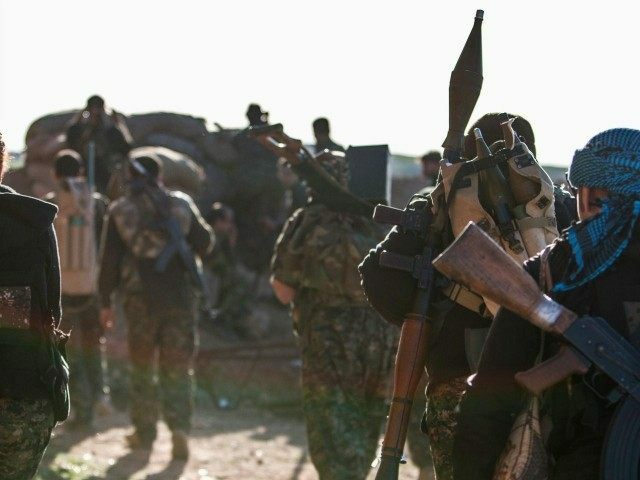 The United States said the Arab coalition, which is now working with the YPG, would receive assistance under a new U.S. anti-ISIS effort, reportedly said Abu Muazz, a spokesman for the Raqqa Revolutionaries Front, a group made up of mainly Arab tribal insurgents from the Raqqa area. Muazz noted that the rebels were told by the U.S. that new weapons were being sent to help them seize the city of Raqqa, an ISIS stronghold and the capital of the Syrian province of the same name, from ISIS. “We met the Americans and this has been approved and we have been told these new arms… are on their way,” said the spokesman. The Pentagon on Friday canceled its failed program to train so-called moderate Syrian rebels to combat ISIS and is now instead focusing on providing “equipment packages and weapons to a select group of vetted leaders and their units so that over time they can make a concerted push into territory still controlled by ISIL,” said Pentagon press Secretary Peter Cook in a statement. Two days later, on Sunday, U.S. forces airdropped 112 pallets weighing 50 tons and containing ammunition for M-16s and AK-47s in northern Syria, Fox News learned from an unnamed senior defense official, noting that the move marks the Pentagon’s shift from training the Syrian rebels to equipping them. The Pentagon confirmed the airdrop to Breitbart News. Four C-17 transport aircrafts made the delivery, which came two weeks after Russia raised the stakes of the civil war in Syria by launching an offensive against opponents of Syrian dictator Bashar al-Assad despite U.S. opposition. “One military official said the drop, by Air Force C-17 cargo planes in northern Syria on Sunday, was part of a revamped U.S. strategy announced last week to help rebels in Syria battling Islamic State militants,” reports Fox News. The new alliance “may bolster the strength of these moderate parties in their fight to prevent radical groups such as ISIS and the Al-Qaeda-linked Nusra Front gaining territory in northern Syria and uniting their voices has already resulted in additional U.S. support,” notes Newsweek. An estimated 240,000 people have reportedly been killed in Syria since the start of the conflict in 2011 and another 7.6 million have been displaced. An additional four million refugees have fled the country. YPG fighters, which have established an autonomous zone in northern Syria and advanced deep into Raqqa province, are the only ones in Syria who can claim victory against ISIS while cooperating with the U.S.-led coalition. Nevertheless, the Obama administration refuses to provide direct military assistance to the Syrian Kurds. U.S. NATO ally Turkey accuses the YPG of being linked to Kurdistan Workers Party (PKK), considered a terrorist organization by both countries.